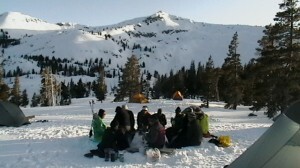 We are so thankful that you want to learn how to Play Safe & Stay Found while enjoying the snowy backcountry. Here is all the course-specific information you’ll need to know prior to your weekend departure date. If you have the time and desire, under the school’s “Resources” tab across the top of every page you’ll find additional materials to prepare you for your exciting weekend! Also, the Mountain Education Facebook page has quite a bit of valuable snow travel information! The SBC is designed to introduce you to the joys of hiking and camping in the snow under the supervision and guidance of an instructor. 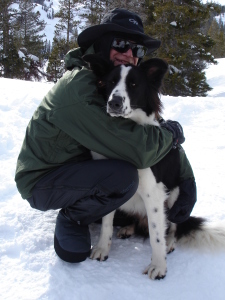 We believe that if you learn how to deal with some of the difficult things out in the mountains with the help of someone who knows what “works,” like cold, ice, storms, staying dry, etc., you’ll have more confidence and security once out on your own. Thus, these courses are offered as s oon as the snow starts flying in January and run ’till mid-April. 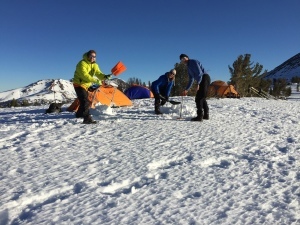 We teach our SBC course from the north side of Carson Pass, highway 88, Kirkwood, CA, because it is so spectacular in scenery, so typical of the Sierra Nevada, and so close to civilization, city centers, and major airports. It is the intent of the Course to pour into you all that we know of “what works” regarding snow-hiking and related issues. So, from the time we meet in the western trailhead parking lot, your instructor will be constantly showing, talking, guiding, and teaching. It is your responsibility to listen, think about it, and apply it under the instructor’s watchful eye during the weekend. Once you are approved to attend your course, you can begin reading or watching select pre-trip published articles and videos to help get you ready (Website “Resou rces” tab and school Facebook page) . There will be group emailings to everyone in your course before your trip’s start date to help you realize what we will be teaching, how to prepare, and to answer questions about parking, weather, transportation and carpooling, and cancellations, should they occur. You have been on a few backpacking trips in your past. You have an idea what exposure and hypothermia are and how to avoid them. 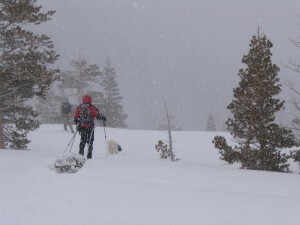 You are in excellent fitness for all-day snowshoeing with no health concerns. 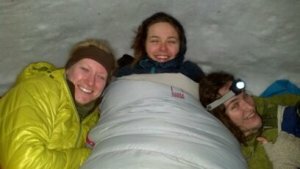 You are willing to learn all the details about snow camping! Young men and women under 18 must be accompanied by their parents. 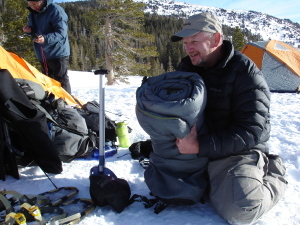 Cost: These classes are available to the public to promote wilderness safety awareness, personal skills confidence, and overall mountain “savvy.” A donation to this charity that provides it is suggested (donation, $450*). (Covers all instruction before and during your skills trip). If you wish to donate to the school, use the PayPal payment link we have on our Donations page. More about our Admission Policies, click on About/Administration. Come with all the food and equipment suggested here and in the SBC Gear List. Note: Certain items that would be sufficient for an ultralight, summertime, dry-trail hike, like a tarp tent or trailrunners, are not allowed. Bring a topographic map of the area north of Carson Pass up to Showers Lake on the PCT (or an equivalent version in detail, color, and scope that covers the same area, i.e., Harrison or Halfmile maps or make your own at www.mytopo.com). 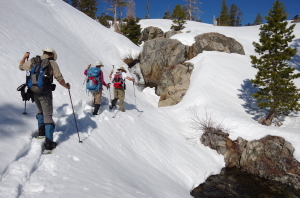 Do not bring black and white maps or photo-copies of the topos as we will teach you how to recognize the color-referenced creeks, lakes and treelines which will aid in your navigation over-snow. Likewise, do not bring your maps on a smartphone—you need to see many miles ahead in order to plot a course. 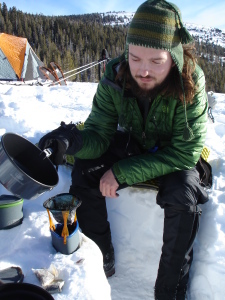 Come with a liter of water with electrolytes and a liter without per person to start as snowshoeing makes you very thirsty and you’ll have water for a hot lunch once in camp! Have some snacks readily accessible in an outside pocket of your pack for the way in. You will not need a bear canister for your food. Additional layers for the cold (i.e. : long-johns, down parka*, down sweater*, wind shell, gloves or mittens, balaclava*, extra socks, down booties*, etc. ), a hat with brim/visor for the sun, and an extra bandana for your sweat. You will be practicing falling and sliding on snow and ice, so do not bring fragile external shells. Bring an extra set of gloves to rotate out when they get wet while snowshoeing or cave digging. 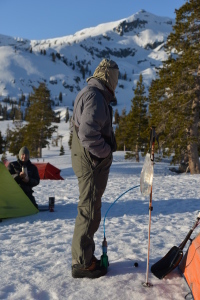 Tall gaiters are a must, especially if we’ve had recent powder or are expecting a storm during the trip. (Pants with internal gaiters will suffice if can be attached to your shoe). *These are especially important for those who get cold easily and/or the weather becomes nasty. Additional “Notes” at the bottom. Toilet paper buried in the snow will resurface in the spring, so either plan to pack it out or burn it upon use. “Wet Wipes” are priceless, too, so consider bringing a sufficient amount, but plan on packing those out, too. Include an empty ziplock bag with your toiletries for this garbage. 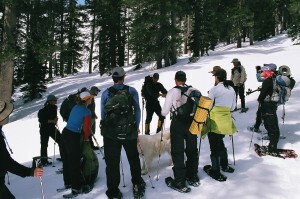 Mountain Education rents certain pieces of equipment which it has tested and endorsed. 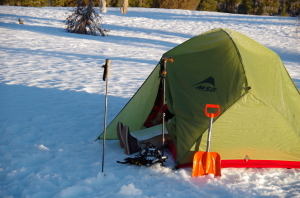 REI and similar Outdoor stores sometime rent sleeping bags, snowshoes and boots, poles, stoves, shovels, beacons, and pads, to name a few. Check your local store for availability. Carpooling can be organized through the pre-trip group emailings. Please bring chains for your drive tires in case we get snow during the class. Practice how to install them before the class while you are still at home. It is, also, handy to have in your car an ice scraper for windshield de-icing and a regular square-point shovel from home with which to dig out your car and the work space around your tires. 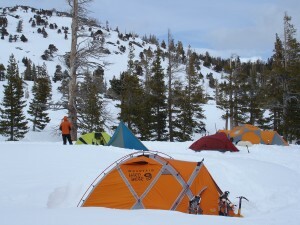 Carson Pass is located on CA Highway 88, just east of Kirkwood, CA and the Kirkwood Ski Area. There are two parking areas, one on the pass with a bathroom and Ranger Station and another to the west 0.25 miles. Please meet in the western parking lot. Arrive by 9:00am. We will leave the parking lot and begin our hike by 10am after pack and fitting checks, some paperwork, and a brief overview of the course. 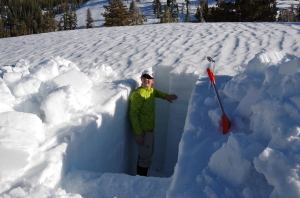 Additional State info on Carson Pass and the Sno-Park parking lot there, go to Carson Pass. Note they don’t show the western parking lot. Pre-trip lodging in town is usually a good idea, especially to get used to the altitude and help you get to the trailhead on time the next morning! Most Tahoe students use the local Motel 6 in South Lake Tahoe, but there are many quaint, little motels and cabins in town or Kirkwood from which to choose that may be as inexpensive. Don’t rule out the Casinos (Harrah’s, Harvey’s, Montbleu) as they have good rooms and buffet-style meals for hungry hikers! 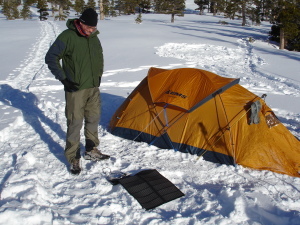 All those little new situations like Sanitation, In-Tent Cooking, and Staying Warm. From the western parking lot of Carson Pass, expect to snowshoe moderately all morning with breaks for food, water, and rest until we get to basecamp just before noon. We will travel as a group and close enough together to be able to hear everyone because there will be frequent stops for teachings and discussion along the way. 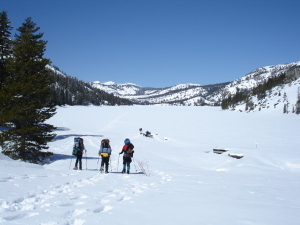 If there is deep powder and we need to learn how to “break trail,” expect to be asked to rotate leading the group briefly and packing down snow, as we move along toward camp. 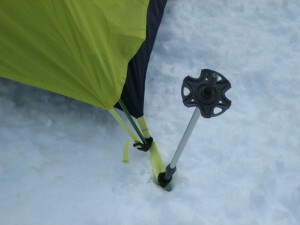 How to deal with wind and snowfall while making camp. But, first, lunch! After the sun sets, the outdoor temperature gets very cold, very fast, so you will quickly realize that it is time for bed. A quick note on midnight sanitation: if you have to go to the bathroom at night, please use the designated latrine location. Bring a lunch, water, and necessary clothing in a day pack. Expect to discuss topographic and GPS navigation, crossing frozen creeks, and finding your way below treeline. We will walk about 6 miles round-trip, go past the old Meiss Barns, and cross the Upper Truckee River in two places. Bring your Rescue shovels and gloves! Lunch follows. After we have rested and eaten, we will break camp and head back to the cars by 4 pm. Always tell someone where you are going and why whenever you leave basecamp (bathroom, water collection, etc.). When traveling, everyone stays together and along a specifically designated route with your instructor in front of your group. For your individual safety and that of your group, conduct yourself as directed by your instructor. Willful disrespect or insubordination to direction will result in immediate expulsion from the course. If any student is in need of assistance, say they are just too tired, it is everyone’s responsibility to lend a helping hand and/or notify the instructor. Mountain Education is not responsible for accident, injury, or death to students who will not take direction or adhere to the rules of individual and group safe conduct as taught preceding and during the course. 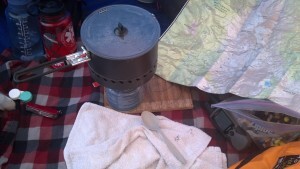 Alcohol Stoves and cold meals, because, should the weather turn nasty, you’ll have to cook inside your tent and need a hot meal. Courses in April may allow attending thru hikers to use their summer, lightweight gear (with a few additions for powder, storms, and the self-arrest clinic) since these students usually head straight from the weekend’s training to the Mexican border to start their thru hikes. Instructor approval required.